American actress Jazmyn Simon is known for her role in the popular HBO series Ballers. The talented actress starred as Julie Greane in 34 episodes of the series. She is also known for her role in the Adult Swim movie The Hindenburg Explodes as Trixie. Simon is working hard to prove her significance in the competitive entertainment industry and has taken significant steps towards achieving that aim. Apart from the characters she plays on screen, Jazmyn is known for a host of other things and here are the other interesting facts about the actress. She was born Jazmyn Nicole Simon on December 30, 1980, in California. Not much is known about her parents but Simon grew up in San Francisco where she was born. She was always inclined to entertainment. This interest of hers pushed her to study communications and later on, theatre. While at school, she would take part in different entertainment shows. It didn’t stop there, Jazmyn Simon later moved to Los Angeles after school to pursue a career in acting. She started taking acting classes as well as workshops related to filmmaking. Before then she had worked at the reputable HBO cable company as a salesperson. Simon didn’t get noticed until 2011 when she got her first role in an episode of Parks and Recreation, an NBC comedy. Two years later, the actress made an appearance in the feature film Baggage Claim. Jazmyn Simon went on to appear in several other series although with relatively small roles. Her breakthrough came in 2015 when she joined the cast of the HBO series Ballers as Julie Greane, the only female lead character. Jazmyn also went on to star in other notable productions. In the year 2017 she starred in Ed, and in 2018 she appeared in Acrimony. The actress plays the role of Trixie in the swim adult movie The Hindenburg Explodes. Jazmyn Simon hopes to keep climbing up the ladder of success. Away from the screen, Jazmyn Simon lives a simple life with her lovely family. The actress is married to popular actor Dule Hill known for the movie West Wing. The actress gained massive popularity with her long-term relationship with now-husband Dule Hill. The couple started dating so many years ago but became engaged in April 2017 after Hill popped the question. It was the most pleasant news for fans of the couple and the general public following news of Simon and Hill’s engagement. To many, it was long overdue especially as the pair began writing their love story as far back as their college years. Maybe Dule was waiting to be ready or waiting for the right time; we may never know, but the long-awaited engagement happened after the couple got back from a hot air balloon date in April 2017. The following year, Jazmyn and Dule got married in an intimate wedding ceremony in the Garden of the Capuchinas in Antigua, Guatemala, with family and friends present. In attendance were some of their colleagues including Allison Janney and Richard Schiff of West Wing. They have been living together since then. 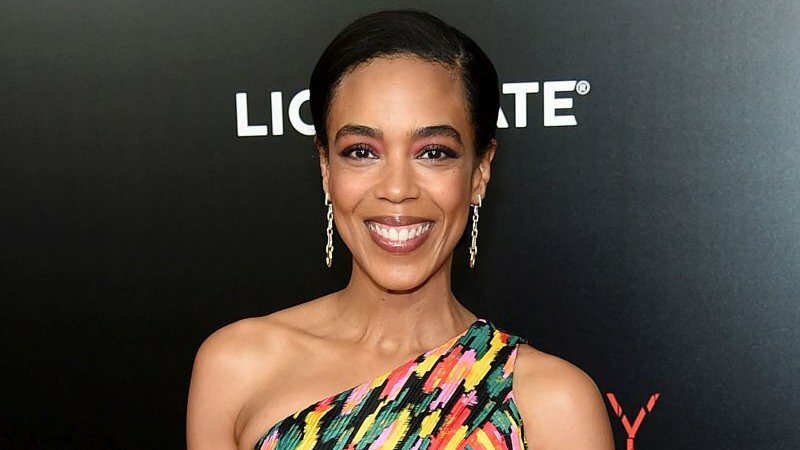 Information was rife in the early part the year 2019 that Simon is expecting her first child with Dule Hill. Jazmyn Simon has a daughter Kennedy with another man. Kennedy has been with her all through the years including with her husband Dule Hill. Body Measurements – The talented actress has got the looks and right features to go with her showbiz career. She stands at a height of 5ft 5in (1.65m) which goes with her suiting weight. Simon is known for her black hair color and dark eyes which gives her a unique glow. Her Ethnicity – Although nothing much is known about her parents, we do know that Jazmyn is of African-American ethnicity and of American nationality. Social Media Profile – Simon has a huge following on social media which has made her pages busy with admiration from fans. She has over 70 thousand followers on Instagram (@jazmynsimon) and on Facebook, she has over five thousand.